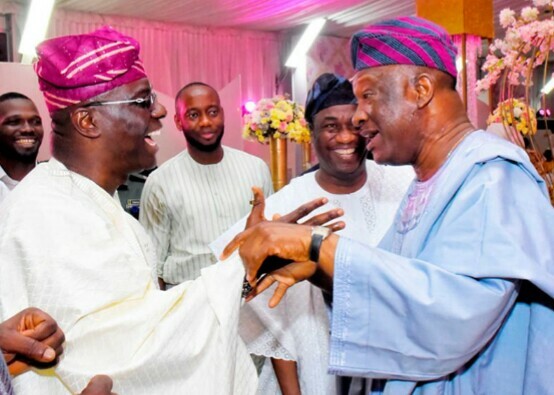 The leading Governorship candidates met at a wedding engagement involving the Shodipo and Dosekun families in Lagos at the weekend. It was like any other meeting of good old buddies — dramatic. They laughed heartily. They shook hands with vigour. Babajide Sanwo-Olu, Lagos All Progressives Congress (APC) governorship candidate and Jimi Agbaje, his Peoples Democratic Party (PDP) counterpart, were joined in the exchange of banters by Obafemi Hamzat – Sanwo-Olu’s running mate. Aides looked on with admiration as the men battling to succeed Goveror Akinwunmi Ambode held hands in a long-time-good-to-see-you manner. Hope they keep it up.